One look at the iLook HD FPV 5.8ghz camera from Walkera and you know you're looking at something well built. The brushed aluminum case is nicely finished and when handled has a feel of superb quality. 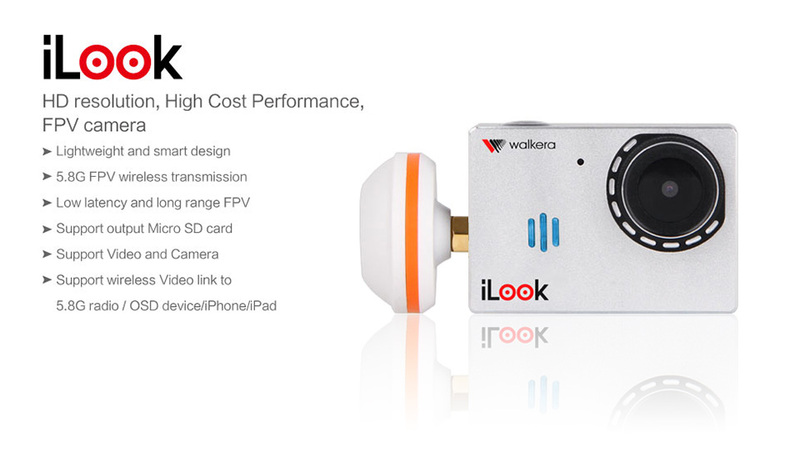 The Walkera iLook unit has a built-in video transmitter and is a capable all-in-one FPV camera. No extra video transmitter is required to piggyback nor do you need an extra battery to carry or mount to the machine. This unit is all in one and that translates to space and weight shaving for maximum payload utilization and capacity. The camera can be hooked up to the main board to draw power to its built in power unit. The weight of the camera is approx 125grams. The size is perfect for various gimbals out in the market, mate it to the Walkera G-2D gimbal and watch it shine. If paired with Walkera units, you can use the Gear toggle switch from DEVO F7 and DEVO 10 to control the video function directly. Best of all its FatShark compatible for those of you that want to throw on some goggles enhance the FPV experience.